This easy eggs soup recipe is soothing and nourishing, as well as elegant to serve. 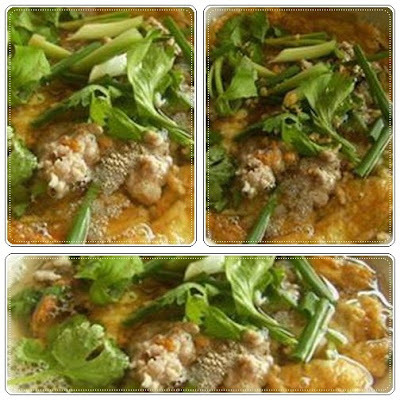 A close relative of Chinese soup, this soup quick and easy to make, and any type of prepared crab meat , pork, or chicken. This Thai-style Eggs Soup is great for everyday eating, but can just as easily be served as an elegant appetizer at a dinner party or other special occasion. ENJOY ka! Heat oil in a wok over low heat, and add beaten eggs, fry until golden brown ( about 2 minutes on each side) and set aside, then cut into small strips. In a pot, bring the chicken stock (or water) to boil. When boiling, add pork and stir until cooked. 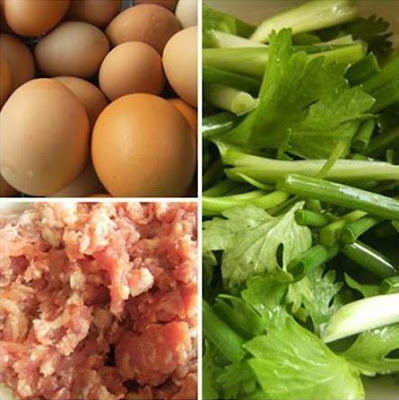 Add onion, chinese cabbages and spring onions, the egg strips,and the remaining ingredients. Remove to a serving bowl. Before serving, garnish with crispy fried chopped garlic on top of the bowl.